Internet Monitor collects, aggregates, and analyzes data about multiple facets of the Internet. We present this data and analysis through our Data Platform and our Data Visualization Dashboard. When possible, we make data available for download (see sidebar). To suggest additional data for inclusion in the dashboard, please see our Contact page. The Internet Monitor platform and Access Index give policy makers, digital activists, researchers, and user communities an authoritative, independent, and multi-faceted set of quantitative data on the state of the global Internet. The platform compiles and curates data from multiple sources, including primary data collected by the Berkman Klein Center and our partners, as well as relevant secondary data. A full list of data sources in the dashboard is on our Platform Data page. 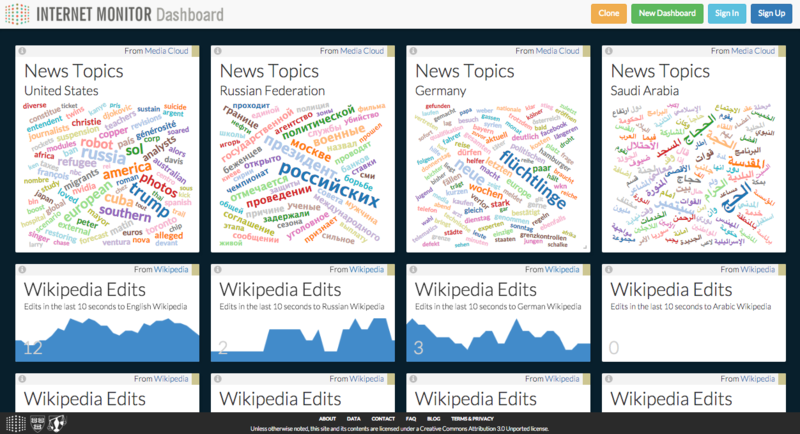 The Internet Monitor dashboard offers users the opportunity to customize a collection of data visualization “widgets” according to their interest. The boards provide a real-time view of the state of the Internet across a variety of dimensions, enable easy comparisons across countries and data sources, and are easy to configure, edit, and share. A full list of data sources in the dashboard is on our Dashboard Data page.